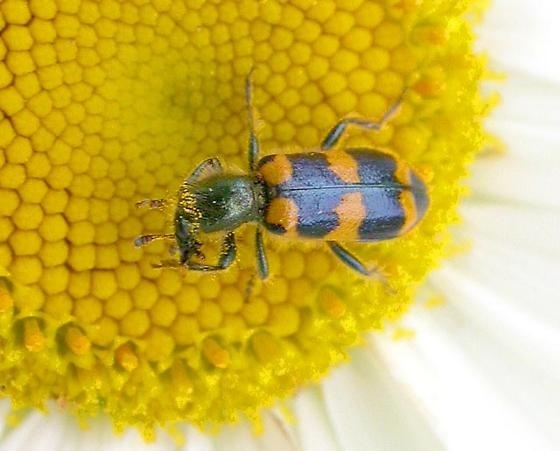 The Checkered Beetles (Cleridae) are a diverse and fascinating group of insects. Corporaal (1950) catalogued 3,366 described species in the world and Opitz (2002) listed 291 species in North America. Of these 15 species are known to occur in Atlantic Canada. 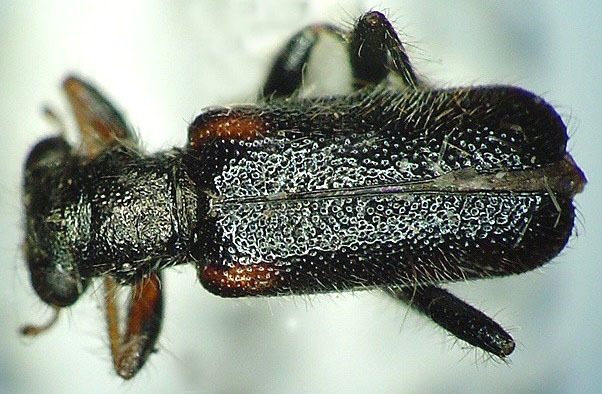 Many of the species found in our area (Thanasimus, Enoclerus, Zenodosus, and Madoniella) are important predators of various lignicolous insects, particularly bark beetles (Scolytidae). Adults can often be found on the surface of fallen limbs and trees which are infested with various kinds of saproxylic invertebrates and both adults and larvae are voracious predators of these. 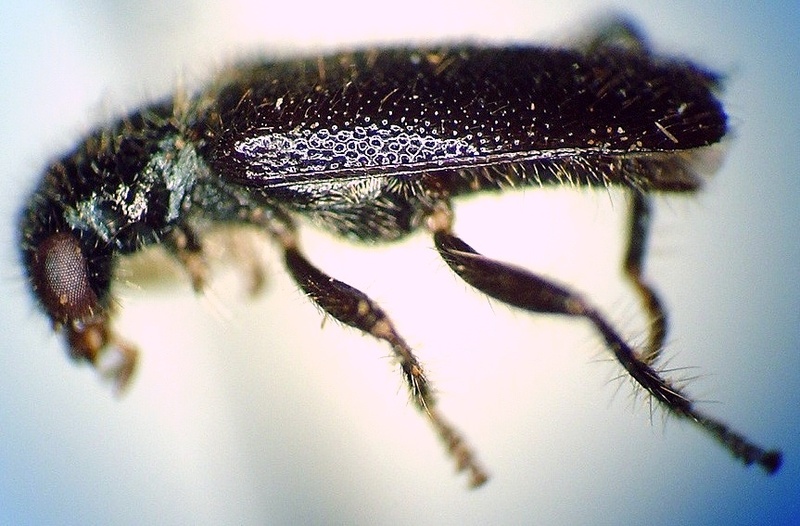 They run swiftly and are able to fly readily and in some contexts are thought to have an important economic role in regulating the populations of such insects. Many species in the genera (Phyllobaenus and Isonhydnocera) are found on herbaceous vegetation. The larvae often feed on gall insects and the adults are predaceous on various insects found on flowers and vegetation. The larvae of Trichodes are predators and/or parasites of grasshoppers or bees and wasps (where they feed on pollen and/or invertebrate contents of nest cells). Species in the genus Necrobia are saprophytic and predaceous and are found on bones, dead skin and, carrion of fish and another animals. The bionomics of the family are diverse and clerids are found in a variety of ecological situations. 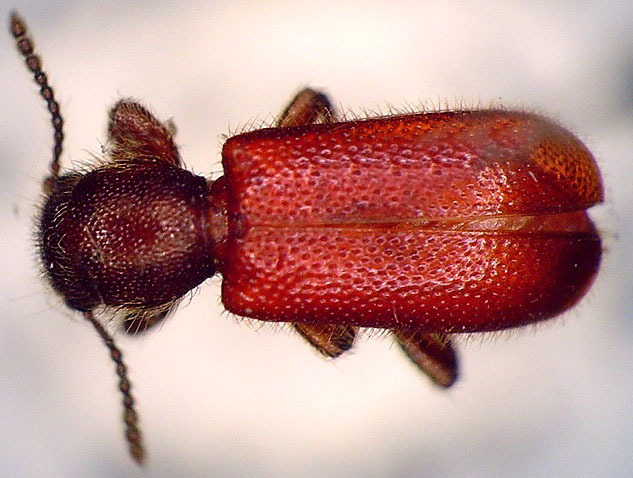 Zenodosus sanguineus (Say): 4.5-6.5 mm. Note the bright red color of the elytra and lack of patterning which distinguishes this species from all other clerids in this region. They have open procoxal cavities and no lateral ridge on the pronotum. 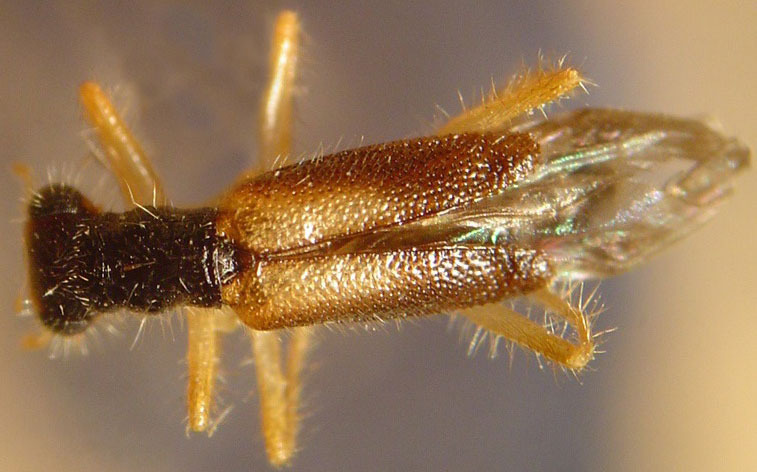 This species is predatory on various sub-cortical and wood-boring insects, particularly scolytines and are typically found in coniferous forests. There are records from Prince Edward Island, Nova Scotia, and New Brunswick. Cymatodera bicolor (Say): 5.5-10.0 mm. 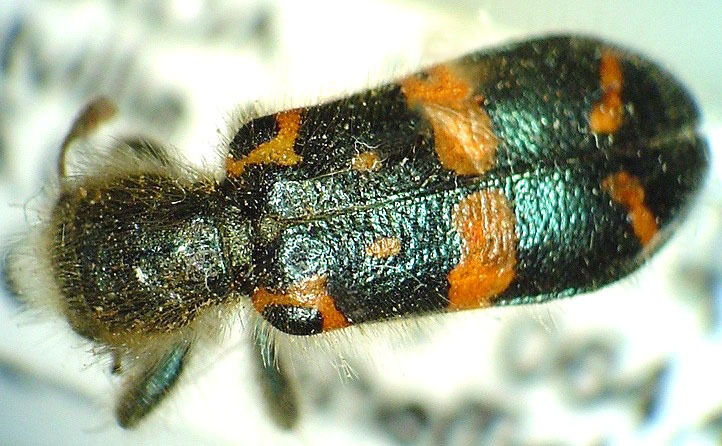 This species is almost entirely black except for the basal and apical margins of the prontum, the legs, labrum, palpi, and basal two antennomeres which are reddish- yellow. This coloration distinguishes this species from all others in the region. The apical antennomere is only slightly longer than the penultimate. 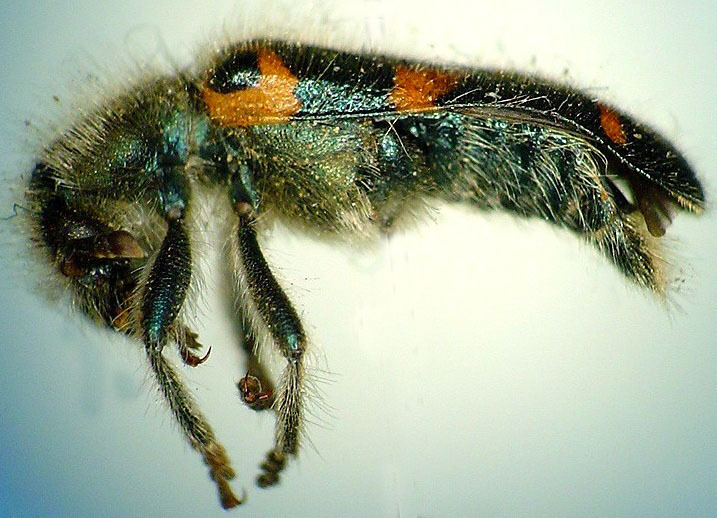 Opitz (2002) reports that adults feed on larvae of cynipoid wasps and other gall insects, fruit tree caterpillars, and larvae of various wood-boring beetles. There is one record from Nova Scotia. Phyllobaenus humeralis (Say): 3.5-5.5 mm. The species of the genus Phyllobaenus are distinguished from related genera by having a broad basal tooth on the tarsal claws. The eyes are only feebly emarginate. This species is almost entirely bluish black in colouration except for the humeral angles which are reddish and the antennae, mouthparts and (sometimes) the anterior legs which are yellowish. The color form difficilis LeConte is entirely dark. Note the expanded margins of the pronotum which form a lateral tubercle. 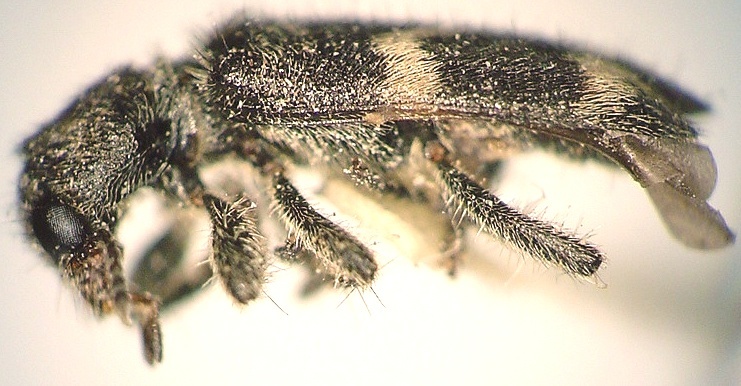 Opitz (2002) reports that they have been reared from in sect galls and are known to prey on small wood borers, immature weevils, and larvae of hymenoptera. They are typically found on the leaves and flowers of various flowering herbaceous plants. In Atlantic Canada the species is recorded from New Brunswick, Nova Scotia, and Prince Edward Island. 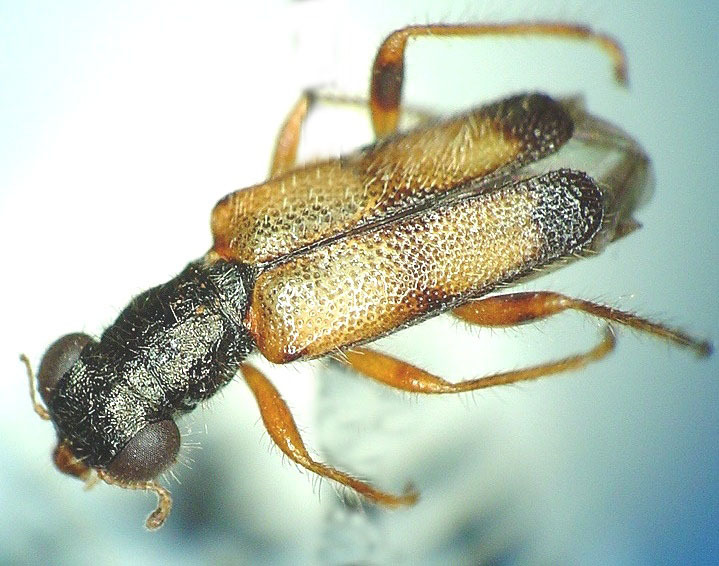 Phyllobaenus pallipennis (Say): 3.0-5.0 mm. Both this species and P. verticallis are distinguished within the genus Phyllobaenus by having a short elytra that does not completely cover the abdomen. Note the coloration: the head and pronotum are entirely dark; the elytra yellowish brown with dark markings at the humeri, along the suture and at the apicies along with a median transverse band. Bionomics: see P. humeralis. In Atlantic Canada the species is recorded from New Brunswick, Nova Scotia, and Prince Edward Island. 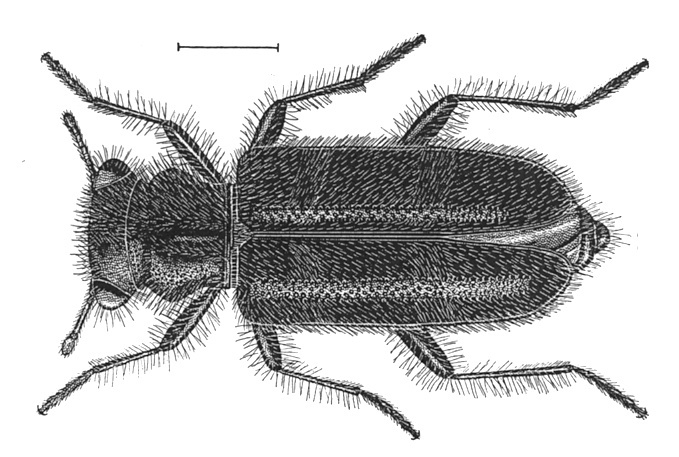 Phyllobaenus verticalis (Say): 3.5-4.5 mm. As is the case with the previous species, P. verticalis also has a short elytra which incompletely covers the abdomen. Although the coloration is reported to be somewhat variable, in general the head is largely dark except for the mouthparts and gulular region; the pronotum, sterna, and elytra are entierley, or almost entirely black. The legs are yellow. Bionomics: see P. humeralis. In Atlantic Canada the species is recorded from New Brunswick, Nova Scotia, and Prince Edward Island. 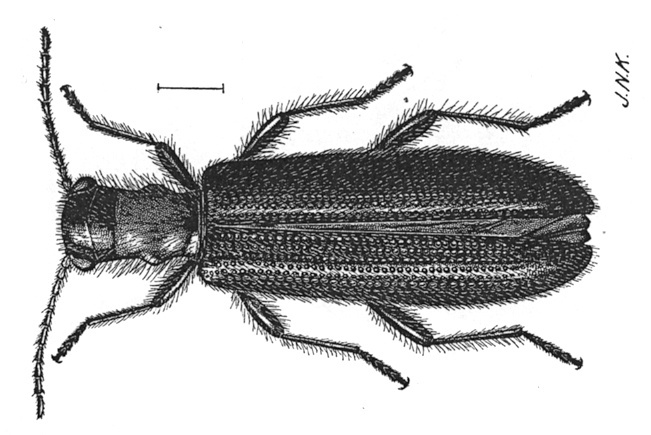 Phyllobaenus lecontei (Wolcott): 3.5-5.5 mm. This species has been found in New Brunswick and on Prince Edward Island. On Prince Edward Island found on pine (Pinus sp.) and elsewhere associated with pine (Downie and Arnett 1996). Isohydnocera curtipennis (Newman): 3.5-5.0 mm. Similar in appearance to P. pallipennis and P. verticalis in that the elytra in this genus is also short leaving a portion of the abdomen uncovered. They differ from Phyllobaenus in having a small basal tooth on the tarsal claws and in having antennomere 3 twice as long as wide. They are an dark bluish black in coloration with the legs, front of head, and a variably sized triangular area at the base of the elytra yellow. Opitz (2002) reports this species from the galls of Euura salicis-nodus Walsh (Hymenoptera: Tentredinidae) on willows (Salix spp.) and those of Gnorimoschema gallaesolidaginsis Riley (Lepidoptera: Gelechiidae) on goldenrod (Solidago spp.). In Atlantic Canada they are recorded from New Brunswick and Nova Scotia. Trichodes nutalli (Kirby): 8.0-10.0 mm. This species has recently been discovered in New Brunswick by Sean Blaney. Not the densely hairy, narrow body and the blue-black elytra with variable orange patterning (usually with a transverse crossbar, and spots around the humeral umbone and sub-apical spots or bars) which distinguishes this species from any other clerid found in the region. The adults feed on pollen and are found on a variety of flowers including goldenrods (Solidago spp.). The larvae are predaceous on a variety of insect hosts including bees and grasshoppers (Opitz 2002). Thanasimus dubius (Fabricius): 7.5-9.0 mm. Species of this genus have a loose anetennal club, a triangular apical maxillary palpomere, and sub-serial punctation at the base of the elytra. In this region two species occur. T. dubius is a larger species with more extensive areas of orange at the base of the elytra. Also not the respective widths and positions of the transverse white bands on the elytra of this species and T. undatulus. 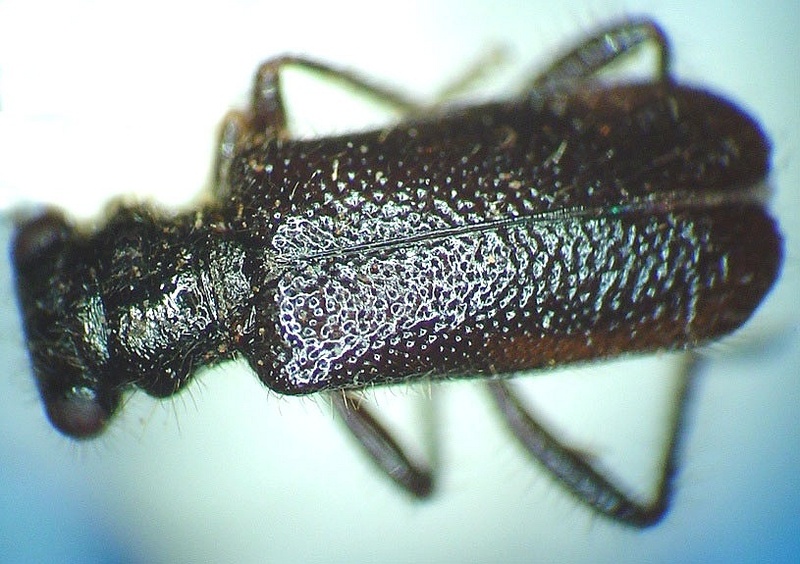 They are frequently found in coniferous forests on dead or dying spruce (Picea spp.) and pine (Pinus spp.). Recorded from both New Brunswick, Nova Scotia, and Newfoundland. Thanasimus undatulus (Say): 7.0-8.0 mm. Similar to T. dubius but smaller and with slightly different color pattern (see above). 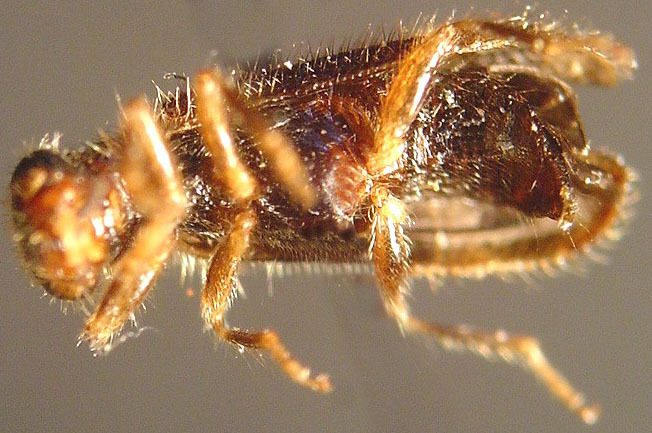 Found in similar habitats to T. dubius (but often more abundant) where they are also avid predators of lignicolous insects, particularly of bark beetles (Scolytinae). Recorded from New Brunswick, Nova Scotia, Prince Edward Island, and Newfoundland. 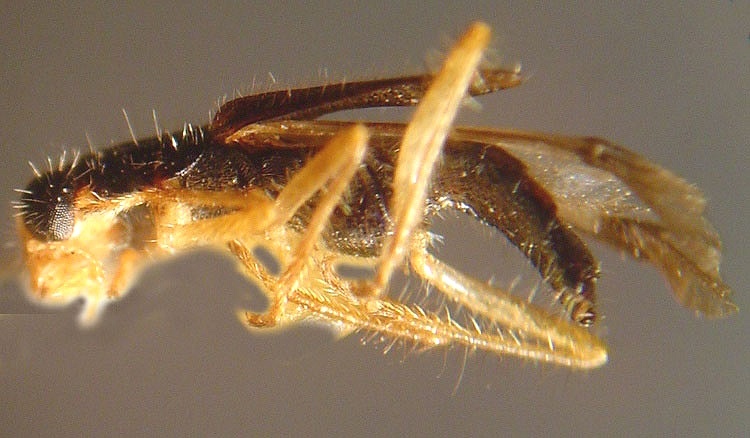 Enoclerus nigripes (Say): 5.0-7.0 mm. Similar in appearance to the genus Thanasimus, however, in Enoclerus the antennal club is dense and the apical antennomere is long, securiform, and sinuate on the inner side. 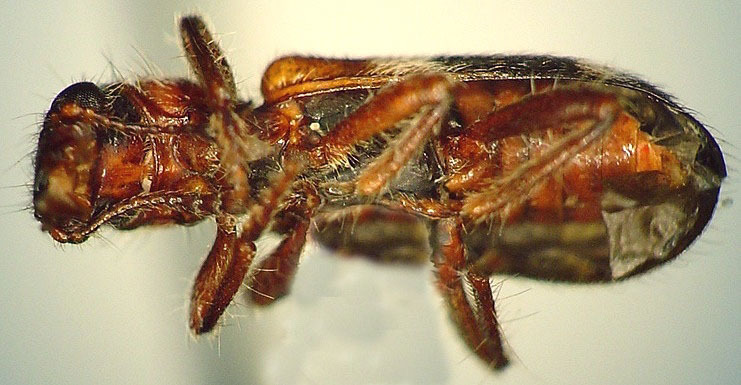 Both Enoclerus n. nigripes (Say) (head, pronotum, and base of elytra reddish brown) and Enoclerus n. rufiventris (Spinola) (entire dorsal surface black) have been recorded in New Brunswick and Nova Scotia. 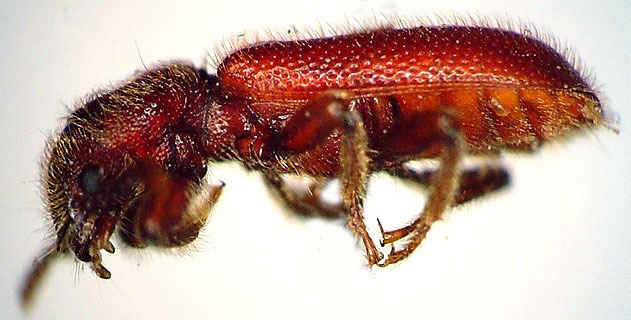 Both adults and larvare are voracious predators of various lignicolous insects, particularly of bark beetles (Scolytinae) and are commonly encountered in coniferous forests where there are dead or dying trees or limbs. Enoclerus muttkowskii (Wolcott): 9.0-10.0 mm. This species has been recorded in the region from one specimen collected in New Brunswick on jack pine, Pinus banksiana. 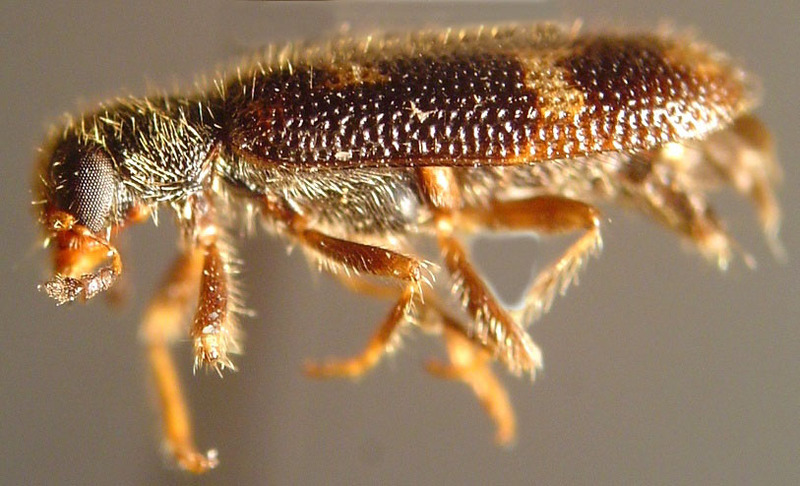 It is known with pine forests and has been found in association with bark beetles of the genus Dendroctonus (Knull 1951). Madoniella dislocatus (Say): 3.5-6.0 mm. This is a slender, narrow species with very prominent rows of serial punctures and an elytral pattern of three yellowish markings; the first running obliquely from humerus to suture, the second an undulate post-medial band, and the third a pair of yellow sub-apical spots. The eyes are emarginate and the funicular antennomeres are not densely setose. The three-segmented antennal club is shorter than the remaining portion of the antenna. 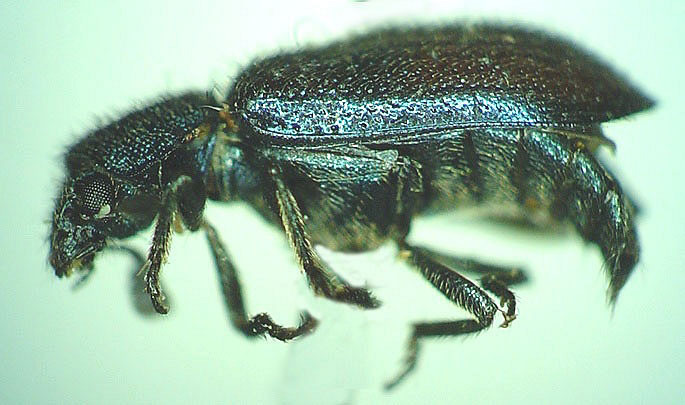 The adults and larvae are predaceous on various wood-boring insects, particularly bark beetles (Scolytinae). 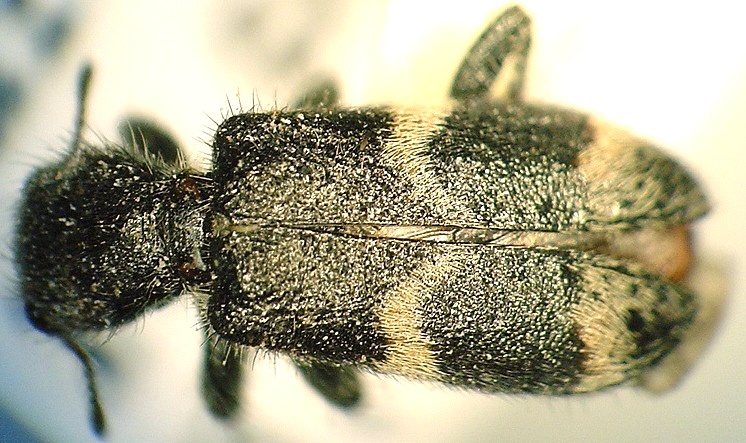 They appear to be rather rare local in their distribution in NB & NS where they are found in coniferous forests. 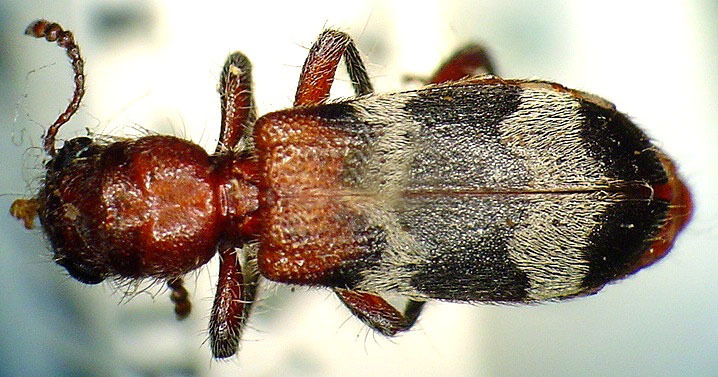 Until recently this species was placed in the genus Phlogistosternus Wolcott 1944. Recorded in New Brunswick, Nova Scotia, and Prince Edward Island. 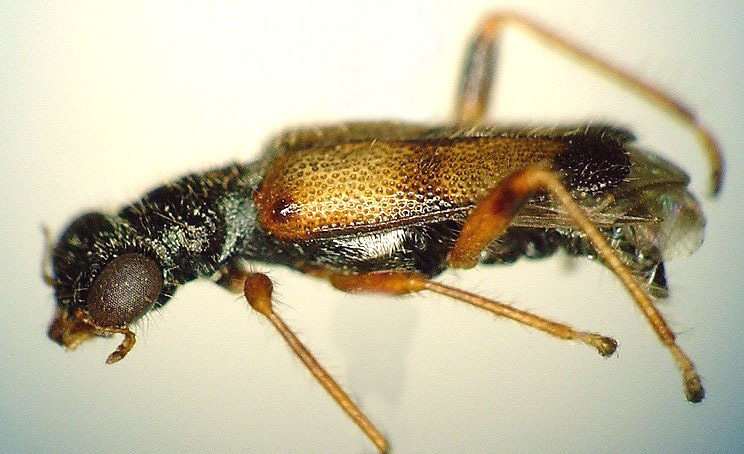 Necrobia rufipes (DeGeer): 3.5-6.0 mm. 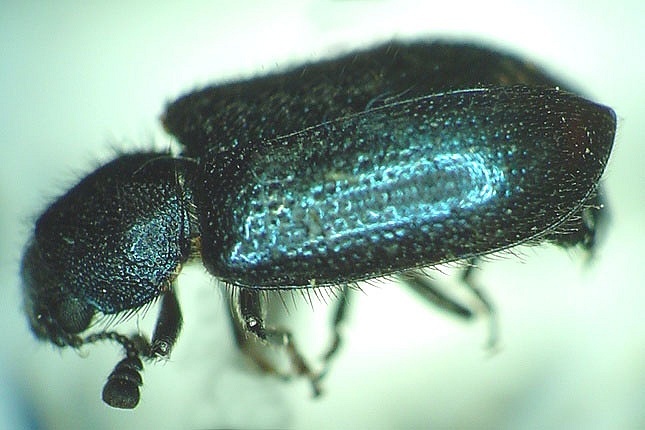 This species and the following are short rounded beetles with head, prontum and elytra a metallic greenish or bluish coloration. A distinctive feature of this genus is that the 9th and 10th antennomeres are narrowly transverse. 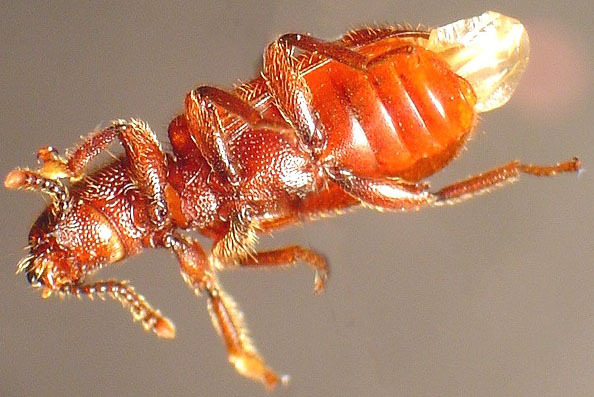 N. rufipes has its legs and basal antennomere reddish brown. They are found on dried fish, skins and bones of dead animals, and other carrion where they are saprophagous and predaceous (Opitz 2002). This is a Cosmopolitan species probably originally from the Palearctic region and introduced here. To date they have only been recorded in Newfoundland and Nova Scotia in Atlantic Canada. Necrobia violacea (Linnaeus): 3.2-4.5 mm. Similar in appearance to N. rufipes except that the legs and antennae are entirely dark. Also found on dried fish, skins and bones of dead animals, and other carrion where they are saprophagous and predaceous. This is also a Cosmopolitan species probably originally from the Palearctic region and introduced here. In this region they have been recorded in New Brunswick, Nova Scotia, Prince Edward Island, and Newfoundland. Many thanks to Sean Blaney, Yves Bousquet, Serge Laplante, David McCorquodale, and Jacques Rifkind for their assistance. Corporaal, J.B. 1950. Cleridae. In: Hinks, W. D. [Ed.]. Coleopterum Catalogus Supplementa, pars 23 (edito secunda). W. Junk, 's-Gravenhage, 373 pp. Downie, N.M. and Arnett, R.H., Jr. 1996. The Beetles of Northeastern North America. Sandhill Crane Press. Gainsville, Florida. 1721 pp. Knull, J.N. 1951. 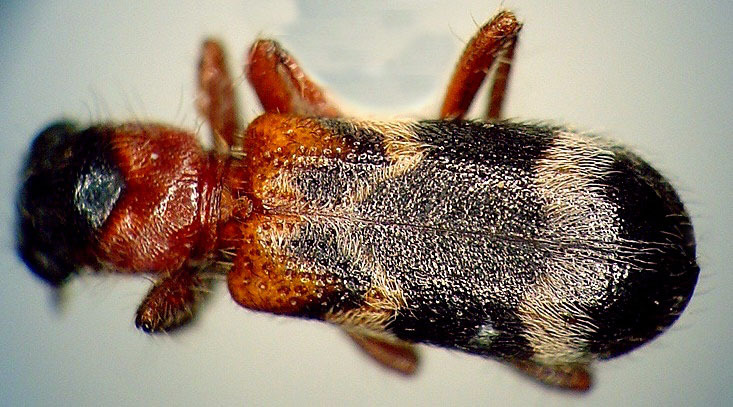 The checkered beetles of Ohio (Coleoptera: Cleridae). Ohio Biological Survey Bulletin, 8(42): 268-350. Majka, C.G. 2006. 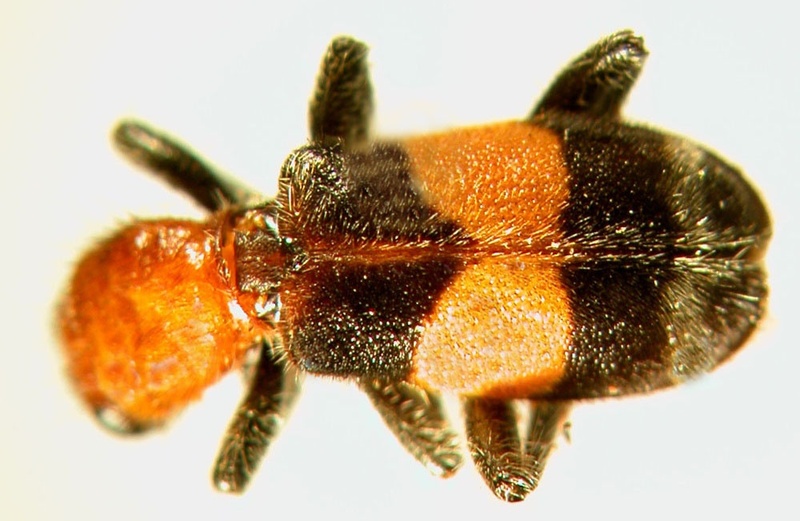 The Checkered Beetles (Coleoptera: Cleridae) of the Maritime Provinces of Canada. Zootaxa, 1385: 31-46. McNamara, J. 1991. 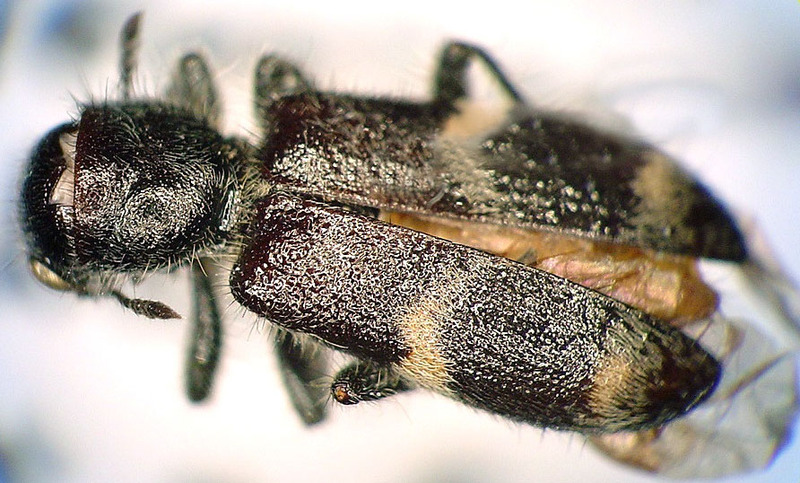 Cleridae: Checkered Beetles In: Bousquet, Y. Checklist of Beetles of Canada and Alaska. Agriculture Canada Publication 1861/E. pp. 208-211. Opitz, W. 2002 Cleridae Latreille 1804. In: Arnett, R.H., Jr., Thomas,, M.C., Skelley, P.E., and Frank, J.H. [Eds]. 2002. 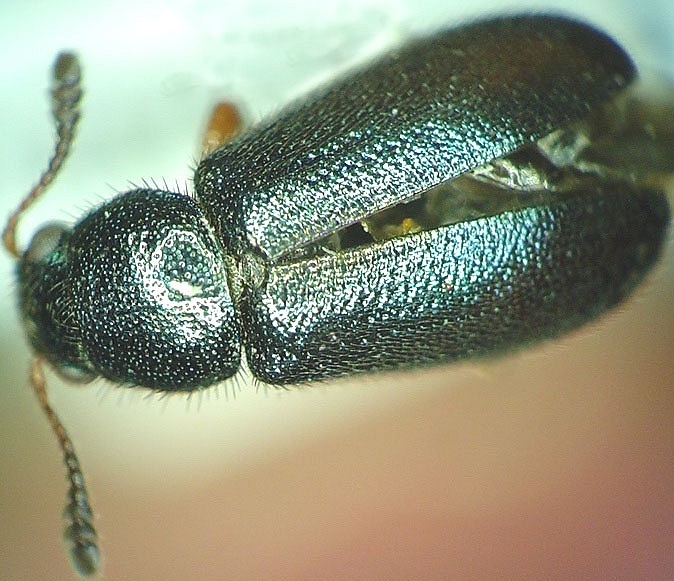 American Beetles, Volume 2: Polyphaga: Scarabaeoidea through Curculionoidea. CRC Press, Boca Raton, USA. pp. 267-280. (c) All rights reserved. Christopher Majka & Empty Mirrors Press. Revised 20 June, 2006.